Starting with ‘anthamizhAl naRkalaigaL Ayndhu uraiththa AzhvArgaL [upadhEsa raththina mAlai – 5]’, till now, he (maNavALa mAmunigaL) explained in detail for everyone to know, about the divine name, month and star day of divine incarnation of AzhvArs, and their divine prabandhams as said in ‘vAzhvAna thirumozhigaL’. After this, he divined in his mind that since AzhvArs’ places of incarnation are also of importance to us similar to ayOdhyA, mathurA, etc., he starts to divine about them through four pAsurams; in this first one of that series, starting with poigaiyAr, he is divining about five of the AzhvArs’ divine places of incarnation, starting the pAsuram with ‘eNNarum seer’. That is, big cities like kachchi (kAncheepuram), etc., are the aforementioned three AzhvArs’ places of incarnation. 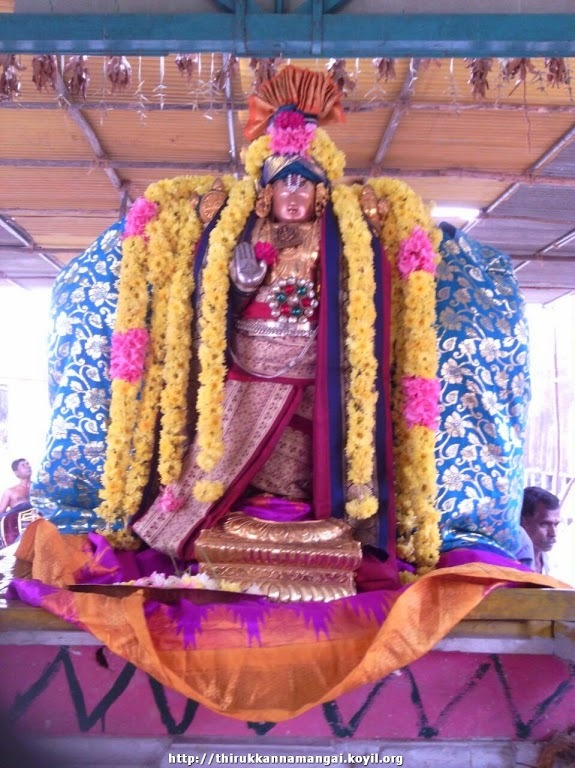 vaNmai (bountiful / prosperity) for kachchi is – as said in ‘niRaindha seermai neeL kachchi [periya thirumozhi – 2.9]’ (~ kachchi with full of greatness), it is filled with dhivya dhESams, and is also beautiful having decorations of a city as said in ‘azhagAya kachchi [periya thirumozhi 2.9.1]’ (beautiful kachchi). It is to be said as ‘ninRan irundhAn kidandhAn [periya thirumozhi 2.4.1]’ (standing, sitting, and lying poses of emperumAn), and ‘idhuvanRO manRAr pozhiR kachchi mANbu’. Or, the greatness of helping the samsAris to have true life by seeing the sarvESvaran lying down in kachchi vekkA, and see poigai AzhvAr who came and rose (incarnated) in kachchi. 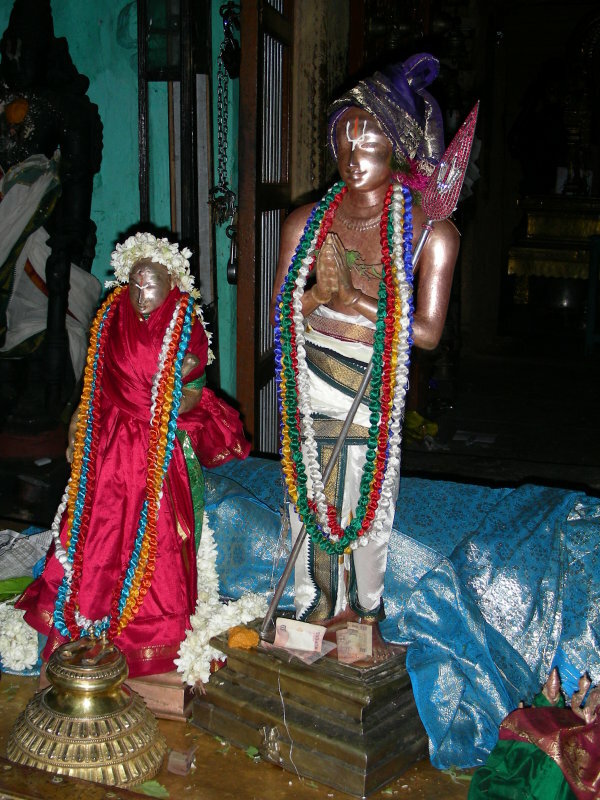 mallai – After saying ‘mallai kachchik kidandhavan Ur [periya thirumozhi 2.6.5], he said ‘kadal mallaith thala sayanam [periya thirumozhi 2.6.6. ]’ (~ thirukkadal mallai dhivya dhESam, with sthala sayana perumAL), isn’t it? So kadal mallai that is equal to kachchi. It is said as ‘vangaththAl mAmaNi vandhu udhu munneer mallaiyAy! [thirunedunthANdakam – 9]’ (~ thirukkadal mallai dhivya dhEsam where priceless gems are washed to the shore by the sea of boats/ships). This place is having priceless jeevAthmA and Isvaran, isn’t it? That is, it is having both bhuthaththAzvhAr as said in ‘seethaththAr muththukkaL sErum kadal mallai bhUthathAr [iraNdAm thiruvanthAdhi thaniyan]’ ((with the inner meaning of) bhUthaththAzhvAr the priceless pearl of thirukkadal mallai), and the emperumAn as said in ‘kadal mallaith thala sayanaththu uRaivAr [periya thirumozhi 2.6.1] (~ sthala sayana perumAL in lying position at thirukkadal mallai)’. mA mayilai – As said in ‘neeLOdham vandhalaikkum mA mayilai [nAnmugan thiruvanthAdhi – 35] (~ great city of mayilai where the waves rush to gently touch the feet of emperumAn)’, it is suitable for pEyAzhvAr to come and incarnate in this place that is a big city. Same is said in ‘vandhu udhaiththa veN thirigaL [mUnRam thiruvanthAdhi – 16], etc. That (place) is also being in the same (great) way. seerk kaliyan thOnRiya Ur maNNiyil neer thEngum kuRaiyalUr – That is, as said in ‘koNda seerth thoNdan [periya thirumozhi 8.10.10]’, having auspicious qualities like gyAnam (knowledge), bhakthi (devotion), etc., and due to that, as said in ‘arumpeRal anbu pukkittu adimai pUNdu uyndhu [thirunedunthANdakam – 5]’, having the wealth of kainkaryam (subservience) through speech and body – such thirumangai AzhvAr. Or, ‘seerk kaliyan’ to call as kaliyan (having strength) as he grabbed the ring from divine feet, and other things like anguLiyam, dresses, jewels, and then stole His whole wealth that is thirumanthram – such greatness. 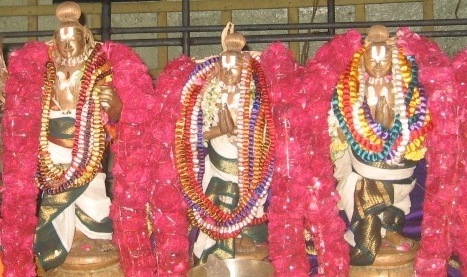 It is said, ‘avaLukkuth thiruvadigaL koduththa thiruvAzhi modhirathO pAdhi ivanukku AchAryan prasAdhiththa thirumanthramum’. (Like the ring that thiruvadi (hanuman) gave to seetha pirAtti, Acharyan has divined him (us) the thirumanthram). AzhvAr having such divine wealth, and his place of birth is having the wealth of water in the rivers similar to that in thirunagari, as said in ‘pongu punal maNNi [periya thirumozhi 4.1.4, and iyal sARRu]’ (Rich water resources of maNNi river). Due to this wealth it is said ‘kali mikka sennel kazhani [rAmAnusa nURRanthAdhi – 88]’ (paddies with bustling and rich grains). This is also like ‘kali vayal thennan kurugUr [thiruvAimozhi 5.2.11]’ (paddy fields of AzhvAr thirunagari that are constantly planted and reaped). That thirukkuRaiyalUr is such that it can be said as a part of thirunagari (in wealth of water, paddy fields, etc). kuRaiyalUr seerk kaliyan thOnRiya Ur, Ongum uRaiyUr pANan Ur – There is togetherness of month and star days for them (both AzhvArs (thirumangai AzhvAr and thiruppANAzhvAr) incarnated in the month of kArththigai, and star days of kArththigai and rOhiNi). pANan Ur Ongum uRaiyUr – Eminence of uRaiyUr is – due to the incarnation of him who is in the clan that is eminent due to being amicable to subservience. Also, as said in ‘kOzhiyum kUdalum kOyil koNda kOvalar [periya thirumozhi 9.2.5]’ ( (emperumAn) like a gOpalakrishNan who is having the place of stay as uRaiyUr, and kUdal (then madhurai)), sarvEsvaran is happily present in this dhivyadEsam (uRaiyUr), and with pirAtti being identified with the name of the dhivyadhEsam as ‘thiruvAzh uRanthai’, and ‘uRaiyUr valliyAr’, as this is the place of her birth – the greatness due to these, for uRaiyUr. So it says that the place having such greatness is the avathAra sthalam (place of incarnation) of thiruppANAzhvAr. This (uRaiyUr) is the area (thuRai) that is opposite to ‘thirumugath thuRai’ (emperumAnAr’s usual place of bathing (guruparamparA prabhAvam – page 262]); so a place suitable to have mutual reciprocation between bhagavAn and his devotees due to the emperumAnAr’s relationship in this place (edhir vizhi kodukkaikku pAngAna dhESam AyiRRu). This entry was posted in Other, upadhESa raththina mAlai and tagged 74, annan, azhvar, bhutham, erumbi, erumbiappa, kachchi, kachi, kanchi, kanchipuram, kovil, mallai, mamunigal, manavala, mayilai, mylai, mylapore, pasurams, pey, poigai, rathina, rathinamalai, raththina, raththinamalai, thirukadal, thirukkadal, thirumangai, thirupanazhvar, thiruvallikkeni, triplicane, upadesa, upadhesa on January 1, 2016 by raghuram. kAN – you learn about this. Then he is divining as a question and answer to his mind regarding the glory of thirumangai AzhvAr’s incarnation day of thirukkArththikai divine star day, starting this with ‘pEdhai nenjE’. Unlike the earlier pAsuram where he said ‘eedhu ivar thORRaththu adaivAm [upadhEsa raththinamAlai – 4] which was in the order of incarnations of Azhvars, from this pAsuram he is presenting in the order of months in which various AzhvArs incarnated. For the sentients, this also would be a sequence to keep in their mind. It is convenient too to go in the order of months. pEdhai nenjE inRaip perumai aRindhilaiyO – Oh the ignorant mind which thinks the other days as equivalent to this special day! The reason of our reaching the true goal that is enabled by this star day is something you could reflect upon, but are you not aware of this important day? OdhuginREn – I, who has understood, shall preach that to you (the mind) who has not understood it. vAiththa pugazh , etc. – As said in ‘manRil mali pugazh mangai mannan [periya thirumozhi 11.2.10]’, he having the glory that matches his svarUpam (nature), the king of thirumangai, incarnated in this great world in the month of kArththikai , in the star day of kArththikai – you note this – is what I am preaching you. It continues as ‘manthiram koL mangaiyar kOn [periya thirumozhi thaniyan]’ (one who got the thirumanthram, he is the king of thirumangai). 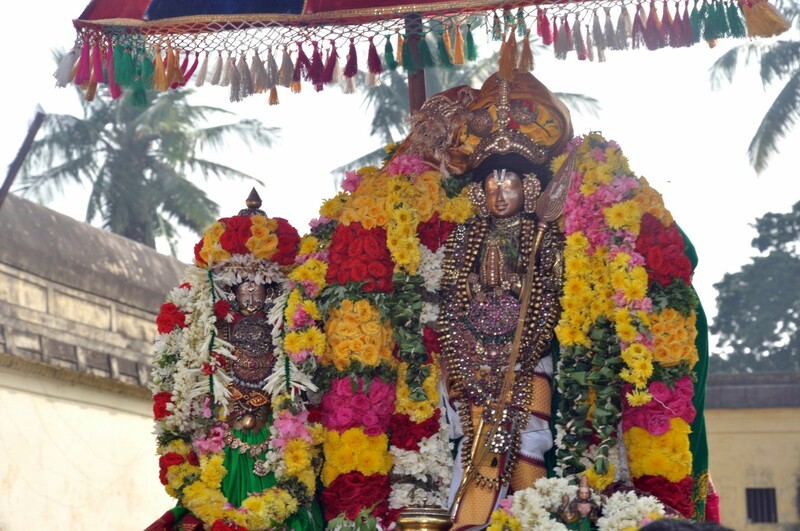 It is the gain of thirumanthram that is the reason for the glory of this AzhvAr. It is ‘vAyththa thirumanthiram [upadhEsa raththinamAlai – 26]’ (~ the great thirumanthram is available (for us)). Or, the place ‘mangai’ got the glory due to this AzhvAr’s incarnation. mangaiyar kOn mAnilaththil vandhu udhiththa kArththikaiyil kArththikai nAL kAN – Such AzhvAr the ruler of thirumangai, incarnated in the month of kArththikai in the star day of kArththikai, to remove the ‘thamas’ that is darkness (ignorance) from this world that is said as ‘iruL tharumA gyAlam [thiruvAimozhi 10.6.1]’ (~ material world that creates darkness) – learn this. Since in ‘kalayAmi kali dhvamsam kavim lOka dhivAkaram [periya thirumozhi thaniyan]’ it is referring to thirumangai AzhvAr as a (rising) sun, here he (maNavALa mAmunigaL) is also using the word ‘vandhu udhiththa’ (rise/rose) to describe the incarnation of thirumangai Azhvar. In this way he had manifested (AvirbhAvam), I have understood this greatness and am preaching this to you (the mind), and you who did not know this, shall now learn and support/follow it. This AzhvAr , as said in ‘nejukku iruL kadi dhIpam [periya thirumozhi thaniyan]’ (~light that removes the darkness in our mind), incarnated to remove the darkness through his prabandham which is like ‘dheiva nan mAlai [periya thirumozhi 1.1.10] (~ beautiful garland for emperumAn). So, this day has come for us to celebrate with light (dheepam), and propitiation (ArAdhanA) (kArththikai dheepam)! We should say as ‘kurvANa: kArthikE mAsi vishNOr dhIpam hi mandhirE [vishNu dharmOththara purANam]’ (light the lamps in vishNu temples during the month of kArththikai), and ‘vishNvAlayEshu kArththikyAm dhIpa dhAnam karOthiya: [vishNu dharmOththara purANam ]’ (In vishNu temples, lamps are donated during the month of kArththikai). Such day matches the glory of the phrase ‘inRaip perumai’ (that is, matches the glory of the day due to thirumangai AzhvAr’s incarnation), as said in this pAsuram. This entry was posted in Other, upadhESa raththina mAlai and tagged 74, annan, erumbi, erumbiappa, kaliyan, karthigai, karthika, karthikai, kovil, mamunigal, manavala, mangai, pasurams, rathina, rathinamalai, raththina, raththinamalai, thirumangai, upadesa, upadhesa on December 10, 2015 by raghuram. Like so after hearing about emperumAnAr’s kind help, even if one surrenders to such subject, what to do if one becomes unstable due to the connection of experiencing happiness and sorrow? 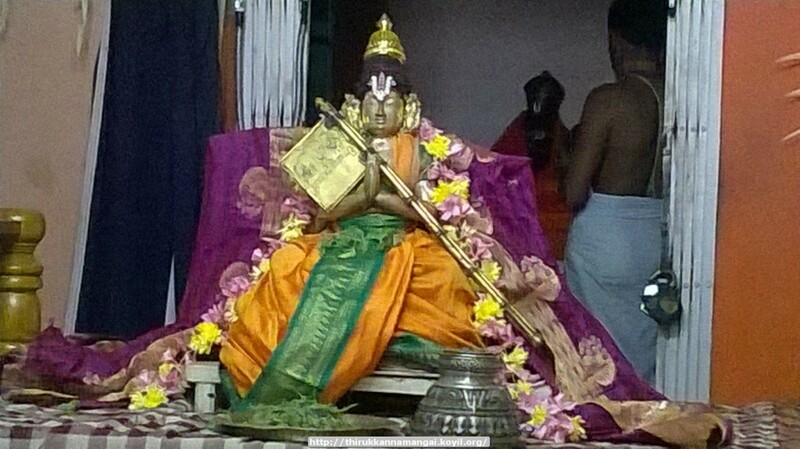 Having friendly connection with thirumangai AzhvAr, and who is our master, that is emperumAnAr, those who have surrendered to him would not become disturbed by such influences, says amudhanAr. In the series of previous pAsurams since it was about emperumAnAr with his connection with AzhvArs, as one gets the taste of samAsrayaNam after hearing about emperumAnAr’s kind help, and surrender to such subject, what could be done if one is disturbed in mind due to the life’s sorrows and happiness? thirumangai AzhvAr who gave us dhivya prabandham regarding paththarAvi (perumAL) at thirukkaNNamangai dhivya dhEsam, to whom emperumAnAr is very dear, those who surrender to such emperumAnAr would not get disturbed by the effects of delights and sorrows, says amudhanAr. manam kaniyAr – would not think in their mind about them as ripe fruit (that everything has come together nicely). So the point is, you too do not fear thinking about the pleasantness and disturbances. ulagil iniyAnai – in this world, for all the devotees, he (emperumAnAr) is the most loved; (including for thirumangai AzhvAr). 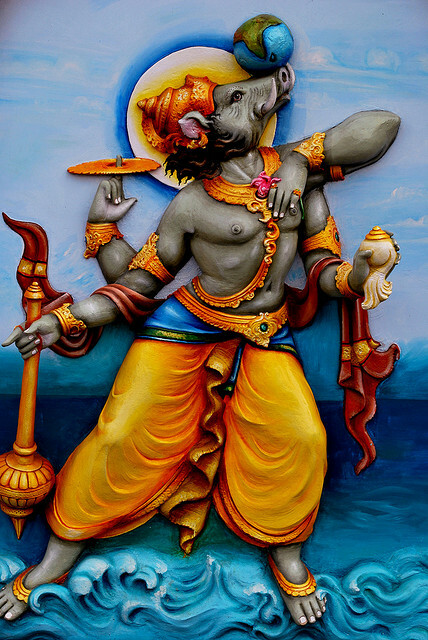 engaL irAmAnusanai – like he did for me, he has divined his incarnation to save everyone; to such emperumAnAr..
vandhu eidhinarE – (they came and attained). As said in “srImAn Avira bhUthbhUmau rAmAnuja dhivAkara:” they understood his excellence and came (back) and joined him standing in queue. muniyAr thuyarangaL mundhilum – when sorrows come competing with each other to reach first and surround such people, they wouldn’t feel sad, thinking Oh why have these come. inbangaL moyththidinum kaniyAr manam – (like bees fly around their food), even if lots of happiness, as if those happiness do not have any thing else to do but be with them, would surround such people, they would not feel elated about them considering them as obtaining ripe fruits like happiness; gIthAchAryan said too, “na prakrushyEth priyam prApya nOdhvijEth prApya cha apriyam [bhagavath gIthA – 5.20]” ((one whose mind is steadfastly fixed on brahmam) – neither rejoices at gaining what is pleasant, nor grieves on obtaining what is unpleasant); and abhiyukththar (vEdhAnthachAryar) too said “mathana kathanai: naklishyanthE yathIsvara samsrayA: [yathirAja sapthathi]” (those who have reached emperumAnAr would not worry about good and bad things]. Happiness and sadness come and go, it is good that the karma is getting reduced, why get excited or become sad – is what emperumAnAr’s devotees think and stay firm. emperumAn is like a proud elephant; but it is such that every one can see and enjoy; such emperumAn wanted to get deeper into the meanings of thirumangai AzhvAr’s prabandham and tried to understand its meanings; periyavAchchAn piLLai’s vyAkyAnam says as AzhvAr saying to emperuman: “if you are interested, then you are going to have to be my sishya and enrich your learning – such is the weight of the core matter of this prabandham”. ‘vandhu’ eidhinar -> amudhanAr says devotees ‘came’ and joined emperumAnAr, instead of saying ‘went’ and joined, because he is always with emperumAnAr. (also, people had forgotten about the truth and their traditional ways and had gone away; now after realizing it due to emperumAnAr, ‘came’ (back) and joined him). neelan was always seeing emperumAn at kaNNamangai to his eyes’ content, and was happy when was being with Him, and sad when was separated from Him; so he was not sad/happy related to material things; emperumAnAr also was immersed in that neelan’s beautiful thamizh, and became dear to him; the sishyAs who depend on emperumAnAr are immersed in being servants of emperumAnAr. This entry was posted in iyaRpA, rAmAnusa nURRanthAdhi and tagged 4000, azhvar, azhwar, dhivya, divya, english, introduction, iramanusa, jeeyar, jIyar, kaliyan, meanings, naalayira, naalayiram, nurrandhadhi, nurranthadhi, nutrandadi, nutrandhadhi, nutranthadhi, parakalan, prabandham, ramanuja, ramanujar, ramanusa, thirumangai, thiruvarangathu amudhanar, vyakyanam on November 22, 2015 by raghuram. pAsuram where thirumangai AzhwAr performs sharaNAgathi to thirukkudanthai ArAvamudhan. varum idar agala mARRO vinaiyE. mARRu vinai – please remove those hurdles by your mercy. In this concluding pAsuram, thirumangai AzhwAr surrenders to the lotus feet of thirukkudanthai emperumAn. 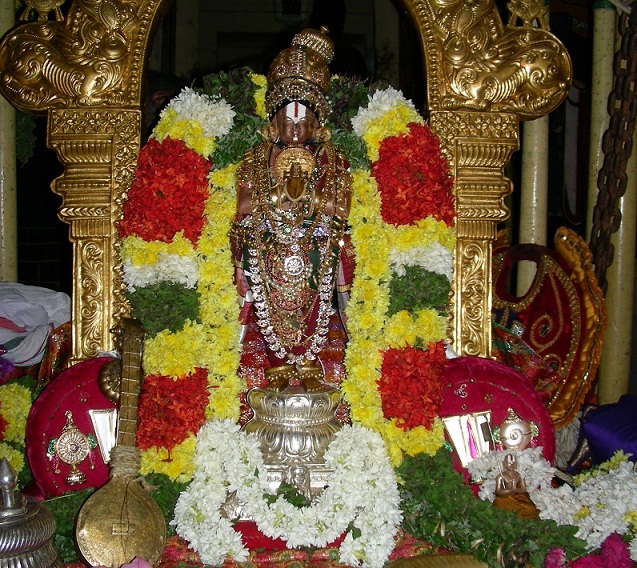 He describes the wealth and nature of the place, how river cauvEry with its rich water base brings in gems and other valuables, how the learned ones living there – like thirumazhisai AzhwAr whose fame spread in all the eight directions – worship the emperumAn with their vEdhanthA sUkthis, and so on. Like nammAzhwAr, here thirumangai AzhwAr also surrenders to ArAvamudhan’s divine feet, and pleads Him to get him rid of the samsAram. Now, “kidandhavARu ezhundhirundhu pEsu” (~ please get up and converse) [thirchchandha viruththam 61], (sung by thirumazhisai AzhwAr), that is, if devotees request/command, He would do as requested/commanded, so thirumangai AzhwAr considers the sowlabhyam (neermai / easiness of attainment) of, and where beauty resides, that is AravamudhAzhwAr, and surrenders to Him similar to nammAzhwAr surrendering to Him. kunRA madhu malarch chOlai – Having groves with ever increasing sumptuous honey, and the flowers that keep adding such honey; if they were fed with manure/fertilizer and water, then those flowers of honey might not grow – since these groves are growing by the flood of nectar that is the divine sight of aravamudhAzhvAr, they grow as during ever existing spring season. vaNkodip padappai – Having beautiful aquatic lands (or gardens) of posts of creepers (or the creepers), and having straws (padappai) and such various creepers, such gardens; or it is talking about aquatic lands having beetel leave plants. ‘vaN’ refers to richness of it and the beauty that shows because of it. varupunal ponni mAmaNi alaikkum – Description of the river Cauvery. Having overflowing richness of water, that brings along and accumulates precious gems; (and the river as described in various texts): “chanjchachchAmara chandra chandhana maHa mANikya mukthOthkarAn kAvErI laharIkarair vidhadhathI” [rangaraja sthavam 1-21] ( kAvEri that comes carrying attractive chAmaram (white hair from the yak tail – used in Fan/whisk), green camphor, sandal, best gems, pearls); “ALariyAl alaippuNda yAnai maruppum agilum aNimuththum veNsAmaraiyOdu ponni malaippaNdam maNdath thiraiyundhu” [periya thirumozhi 3-8-3]; chandhinOdu maNiyum kozhikkum punal kAviri” [periya thirumozhi 5-4-1], “vEyin muththum maNiyum koNarndhu Ar punal kAviri” [periya thirumozhi 5-4-9], “thisai vil vIsum sezhu mAmaNigaL sErum thirukkudanthai” [thiruvAimozhi 5-8-9]”— so made are the pAsurams on kAvEri, isn’t it? kaRpOr purisai – In the place where it was said “thisai vil veesum sezhumAmaNigaL” [thiruvAimozhi 5-8-9], that talked about great personalities who lived in the city (thirukkudanthai), like thirumazhisai AzhwAr and others whose fame spread in all eight directions, “purisai” stands for puri – city/place. Or, when read as “puri sei” it implies the city that was made; Or, “purisai” as the protective wall”, like “kaRpu Or purisai” where the divine walls have nice designs made in them. nimir kodi visumbil iLam piRai thuvakkum – the flags that are mast in such palaces, are long and tall and such that they, up in the sky, caress the young moon with their hoods – shows the greatness of the palaces; thuvakkum – can consider as touching it by surrounding the moon, or as stopping it. selvam malgu then thirukkudanthai – In thiruk kudanthai that is of the best wealth and sweetness. ‘selvam malgu’ to show the greatness of wealth, ‘then’ to show its sweetness. andhaNar manthira mozhiyudan vaNanga – brAhmaNas who consider only You as their desire, who are well versed in the vEdhas, go unto you and recite the vEdhAntha sUkthis which they safeguard from being heard by those not qualified/eligible, as said in “manthram yathnEna gOpayEth” [try hard and hide/safeguard the manthras]. Adu aravu amaLiyil aRi thuyil amarndha parama – expanded due to the contact of emperumAn’s divine body, He lies down on that thiruvananthAzhwAn (AdhisEshan) as the bed, and thinks deep about helping the world; and due to that You appear apt to be said as “You are The sarvEshwaran”! Adu aravu – snake that dances with its hood open. Also can say that as thiruvananthAzhwAn inhales and exhales, he is like a sleeping cradle as he shrinks and expands his body. 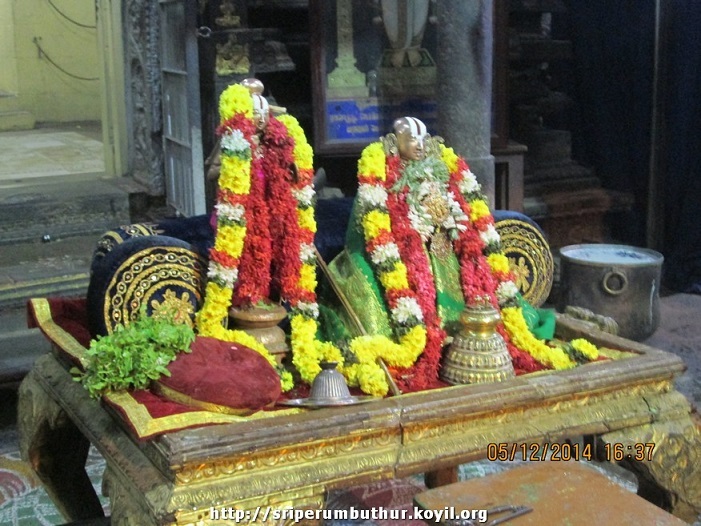 varum idar agala – For the enemies that appear in this world which prevent me from enjoying your divine feet and also from enjoying your nature, appearance, and character (svarUpa rUpa guNam), which is ..
mARRO vinaiyE – the connection with the samsAram, You please rid me of that biggest sin/trouble. 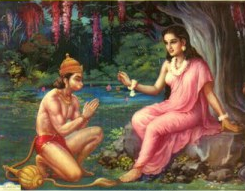 adiyiNai paNivan … maRRO vinai – adiyEn surrendered to you as the means as per my (AthmA’s) nature; You please rid me of the sadness because of connection with the samsAram, as per Your nature. Like nammAzhwAr who said “thariyEn ini un charaNam thandhu en sanmam kaLaiyAyE” [thiruvAimozhi 5-8-7], thirumangai AzhwAr thus surrenders to Him with divine thiruvadi as the means for getting rid of unwanted and for achieving the wanted (anishta nivruththi, ishta prApthi). Note: This section concludes the vyAkyAnam for thiruvezhukURRirukkai. One more thing.. there is a next section, which is about what poet kambar has written as a pAsuram about thirumangai AzhwAr; traditionally it is also included when reciting thiruvezhukURRirukkai. 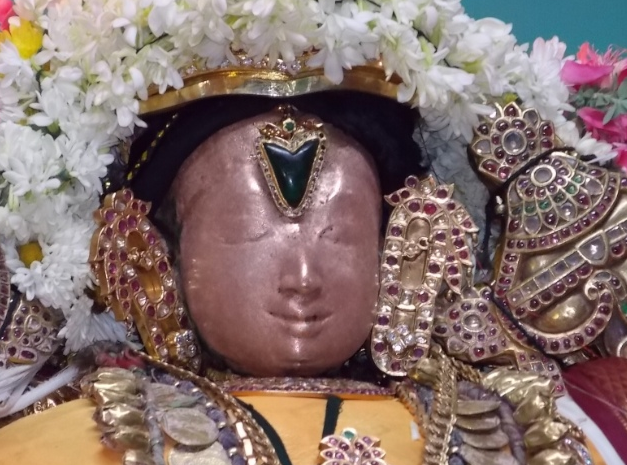 Agaththu iruththinai – have placed her in your divine chest. onRu Ai virindhu ninRanai – just the self (in the beginning), and then expanded as the whole world. These phrases talk about the aishwaryam (parathvam) of emperumAn. It is impossible for those denying the emperumAn, that is those who believe in other six philosophies to reach/know emperumAn. You have placed srIdhEvi pirAtti in your divine chest, where she stays at all times, to do purushakAram (recommendation). You are the grantor of the four goals of beings; you are the antharyAmi of the three mUrthys; You are the one who controls the happiness and sadness of beings according to their karmas; You who was the only One existing during praLayam (annihilation), expanded into many, and gave names and shapes to things, and You are responsible for their being as the antharyAmi. So it is not possible for me to lose you because of any lack of greatness/aishwaryam on Your part, says thirumangai AzhwAr. aimpAl Odhiyai Agaththu iruththinai – You hold periya pirAtti in your divine chest; periya pirAtti having the five identifications of a good hair – being curled, shining, fragrant, dense, and soft. When saying “mangaiyar iruvarum varuda” in a previous phrase, it referred to both srIdhEvi and bhUdhevi as doing purushakAram, but here it mentions the importance of srIdhEvi who is always present in the divine chest of emperumAn; so this is not insignificant. Or, it can be taken as this referring to srIdhEvi here to imply that emperumAn gets His aishwarya, (parathva), soulabhyam, beauty etc., due to pirAtti only. This idea is used in the upcoming phrases. To begin with it talks about His aishwaryam. aRam mudhal nAngavaiyAy – You are the four goals (purushArtham) – that are, aRam (dharma/charity), poruL (things/wealth), inbam (pleasure/happiness) and vIdu (srI vaikuNtam); “chathurNAm purushArththAnAm dhAthA dhEva: chathurBhuja:” [nArAyaNan who has got four arms, is the one who grants the four purushArthas]. 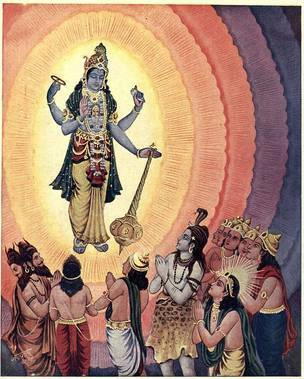 [ By worshiping vishNu, dhevEndhra got three worlds, kubEran the wealth, kArththa vIryan the fame that spread to the three worlds, and janaka mahArAjan the paramapadham; such is vishNu bhagavAn who grants what one wishes.] – so since he is the one who can give the four goals, He himself is those goals, so says AzhwAr. mUrthy mUnRAi – Three mUrthys, that are: brahmA, rudhra, and indhra; emperumAn is the antharyAmi in them; Or, if considering the three – brahmA, vishNu, rudhra, then it talks about how emperumAn stands between the two and does the protection himself, and does the creation and destruction as antharyAmi in brahmA and rudhra. [creation, protection, and destruction are the three activities for which janArthdhanan takes the three names (and forms) of brahmA, vishNu, and shiva], so said srI parasara rishi. iruvagaip payanAi – happiness, sadness are the two types of states due to karmas – he is the one who controls them. onRAi virindhu ninRanai – during praLayam (annihilation), all the things would be without any name or form and stick together with emperumAn, so he is said as ‘sadhEva” [chAndhokya upanishad 6-2-1], that is, He is the only one existing; then during creation, he decides “bahu syAm” [chAndhokya Upanishad 6-2-3] (I shall become many/multiply), and expands to many things that get name and form. Or, instead of creation, and praLaya (annihilation) times, it can also mean that during all times, all the things are parts of Him, so we can say “sentient and non-sentient things are parts of the body of emperumAn; such emperumAn is the one truth” – he is such. And it can be considered as follows. Even though He is having these things as his body, He is not affected by the blemishes of those things. Note: With this the phrases that follow a numbering pattern ends. In the next pAsuram of this prabandham, thirumangai AzhwAr surrenders to thirukkudandhai emperumAn. This entry was posted in iyaRpA, thiruvezhukURRirukkai and tagged 4000, azhvar, azhwar, dhivya, divya, english, introduction, jeeyar, jIyar, kaliyan, kutrirukkai, meanings, naalayira, naalayiram, prabandham, thirumangai, thiruvezhikURRirukkai, thiruvezhu, vyakyanam on July 10, 2015 by raghuram. mE thagum ai perum pUthamum nIyE – You are the antharyAmi of all the five elements (bhUthams) into which AthmAs can enter into and get set into them. After talking in the previous phrase about yOga nidhrA (aRi thuyil – meditation) for protecting, it now talks about how He protects us, lets us be. He created the four varNas and required them to follow the ways set for them, for worshiping Him. He does not like to be worshiped in other ways by the respective people of the varNas. The varNas can be said as He himself. 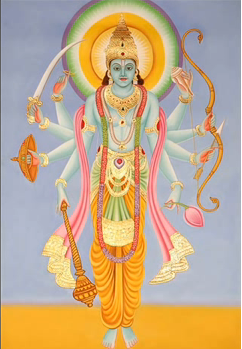 He let the AthmAs set into the body that is made of the five elements, and lets us think that we are human, dhEva, etc. He is the antharyAmi in these elements. Thus He protects us as He lets us be, and helps worship Him. Azhwar wishes that emperumAn would remove the hindrances that prevent Him from getting Azhwar too. After talking in the previous phrase about yOga nidhrA (aRi thuyil) for protecting, it now talks about how He protects us. neRi muRai nAl vagai varuNamum Ayinai – You are the four varNas (brAhmaNa, kshathriya, vaishya, and shUdhra) who conduct themselves within the respective limits set by the sAsthras. Says that these four varNas are under your control. Since you gave these four varNas to the AthmAs, and since you are the target of the conduct/worship of these varNas according to their ways, it can be said that ‘You are the four varNas’, is the opinion. – these are the meanings of what sAsthras have provided, isn’t it? mEthagum aimperum pUthamum nIyE – The elements of the body into which AthmAs enter and get set – earth, water, fire, air, space – all these grand elements are You only. That is, they are controlled by You. 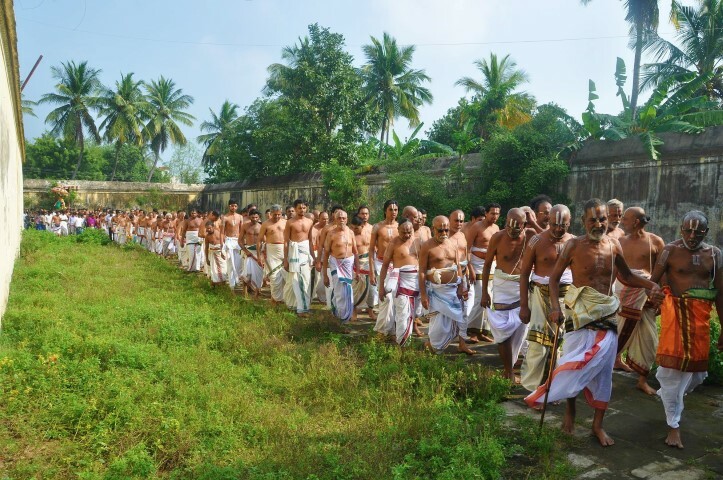 mEthagu – enter and settled well into; that is, as said in ‘yAdhAnum Or Akkaiyil pukku angu AppuNdum” [thiruviruththam 95] – the AthmAs enter the bodies of dhEvas, humans, etc., and they get set into them to the extent of making them think “dhEvOham manushyOham” (I am a dhEva, I am a human), and they become eligible to follow the karmAs according to those bodies they entered into. In yOga nidhrA, emperumAn thought of the protection of beings, and the previous phrase talked about the common aspects of creation, existence, etc. Now it talks about a special case of Him protecting nappinnai pirAtti. aRupadha muralum kUndhal – bees, which have six legs, are buzzing around and settling into the hair of nappinnai pirAtti, for the sumptuous honey ; for the reason of getting such a nappinnai..
By this, “Like how you removed the hindrances for getting nappinnai pirAtti, please grace me and remove the hindrances that prevent You from getting me” is the idea that thirumangai AzhwAr shows in this phrase. aRi thuyil amarndhanai – while you are immersed in meditating sleep (yOga nidhrA). thirumangai Azhwar next says that it would be possible for him to enjoy the beauty of emperumAn because of the purushakAram (recommendation) of pirAttis (divine consorts) who because of their beauty are able to make emperumAn listen to their words. Azhwar concludes that it would not be possible for emperumAn to not help him enjoy emperumAn when there are pirAttis who would make sure of that, with their beauty, age, and service to emperumAn. nin Iradi . . . – thirumangai AzhwAr shows that for getting the benefit of enjoying his beauty, there is also support of able mediation (purushakAra balam). oru madhi mugaththu – unlike the moon seen in this world, their faces are like a complete moon without any blemish, and their faces are pleasant and show how they are drinking the beauty that is emperumAn. mangaiyar iruvarum – Like said by “thulyasheelavayO vruththAm” [rAmAyaNam – sundhara kANdam 16-5] [she possesses equivalent character, age, and actions (as emperumAn)], and by “yuvathishcha kumAriNI” [she is near the end of young girlhood and near the beginning of womanhood ], they with their suitable age can make emperumAn their bhaktha and a mad lover (like said in “pAr vaNNa mada mangai paththar piththar pani malar mEl pAvaikku” [thirunedunthANdakam 18] ) – such are the two pirAttis – srIdhEvi and bhUdhEvi (thirumadanthai and maNmadanthai). muppozhudhum varuda – During all the three times – future, current, and past (edhir, nigazh, kazhivu), they caress emperumAn’s divine feet with so much hesitation (to avoid disturbing the delicate and beautiful lotus feet) as said in “vadivu iNai illA malar magaL maRRai nila magaL pidikkum mel adi” [thiruvAimozhi 9-2-10]. aRi thuyil amarndhanai – As You keep thinking while lying down, “how to save the whole world, especially how to save his devotees?”, you are in such a state that you would not get up even if arrows are thrown at You! “aRi thuyil amarndhanai” – “It is not possible for adiyEn to not get the benefit (You) because of any lack in Your part of thinking of saving your devotee (since you are always thinking about saving everyone)”. There are two phrases covered in this article. In the first part, Azhwar says that when it is not possible even for rudhran who possesses excess knowledge and strength, it is impossible for regular ones like adiyen to know/reach you using such knowledge and strength; so it is You who has to help us by your causeless mercy. It describes rudhran having additional eyes (knowledge), and four shoulders, with a snake having five eyes, and having gangA in his matted hair (additional strength). In the 2nd part, it describes how emperumAn as srI varaham (wild boar/pig) lifted the world and saved it from the praLayam (annihilation) when others like rudhran also were affected (let alone help us) by the praLayam. Now, in the previous phrase thirumangai AzhwAr said that upAsakars are able to understand emperumAn, but it is only to the extent that they see based on what they meditate on, and not that they can fully comprehend His guNams/characteristics. To show this, AzhwAr points out that perumAn is such, that even rudhran who is greater in knowledge and strength cannot identify emperumAn’s guNams fully well. mukkaN …. – the phrase says that rudhran who has got additional eyes (eyes holding the inner meaning to imply knowledge/gyAnam), and who is mentioned as “IshvarAth gyAnamanvichchEth” [should wish to get knowledge from sivan], is proud of such knowledge; and with that if he tries to fully determine about emperumAn, even such a rudhran cannot achieve that – such is the nature of emperumAn. mukkAN – one having three eyes; having more eyes implies having more knowledge. nAl thOL – seeing sarvEshvaran having four shoulders, he (rudhran) is also having four shoulders; also implies having more strength (shakthi); As said by “onRiraNdu kaNNinAnum unnai Eththa vallanE” [thiruchchandha viruththam 7], thus holding excess knowledge and strength he still cannot understand emperumAn, so there is no chance for others to know emperumAn is what Azhwar is letting us know. aRivarum thanmaip perumaiyuL ninRanai – Even with all these knowledge and strength, You are unreachable – such is your grand nature; by this, “If this is the situation for rudhran who has got such great knowledge and strength, it goes without saying that for those with negligible knowledge and strength, like adiyEn (this humble servant), it is impossible to use such things to know/reach You; (so) It is You who has to help us with your causeless mercy” – this is what thirumangai AzhwAr shows with this phrase. Ezhulagu eyiRRinil koNdanai – when there was danger to this world due to praLayam, such rudhra, etc., did not help, but only You helped. When the praLayam caught everyone including rudhran who possess knowledge and strength, and us the opposite (who lacks knowledge and strength); You took the form of mahA varAham that does not hesitate about water or mud, when all the worlds were stuck to the walls of the spheres of the universe; and You entered into and pried out and kept the world shining in the tip of your white tusks – like a bee in a lotus; like a blue diamond fixed in a silver ornament; by this, AzhwAr is letting emperumAn know that “like you saved the earth that got into the praLayam, please have mercy save me from the praLayam that is this samsAram”. By “Ezhulagu” it is implied the seven worlds above and the seven below, that is, all the worlds.